Since you know the grammar checker tools is used as a means to identify any type of grammatical mistakes or other sentence structure related issues in many different languages that a simple spell checker might not be able to detect. There are plenty of tools allows you check grammatical mistakes in many languages without charging any penny. Though most of these grammar checkers simply detect many of possible contextual mistakes in English, French, Spanish, German and some 20 plus other different languages through grammar and spell check. So, the Russian grammar checkers also works on the same principle of Russian grammar rules, exercises and punctuations. 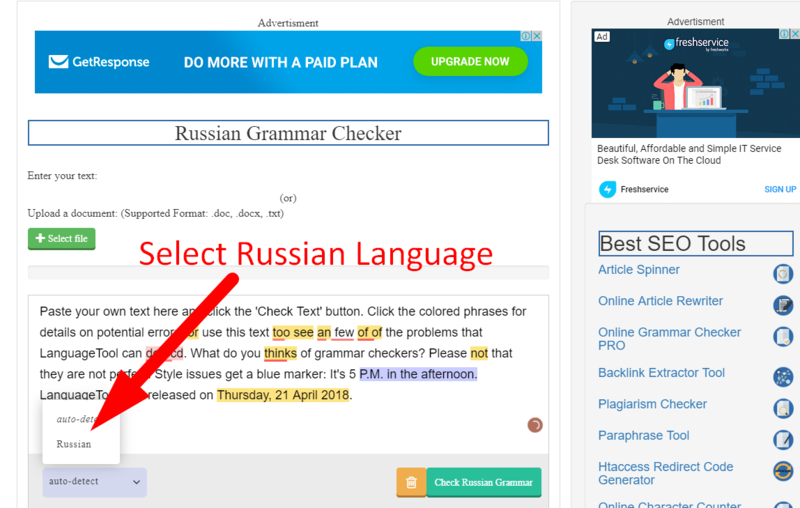 We designed in such a way to find basic grammatical, stylistic and spelling mistakes usually found in Russian text by allowing you to learn Russian grammar in an amazing and unique way. 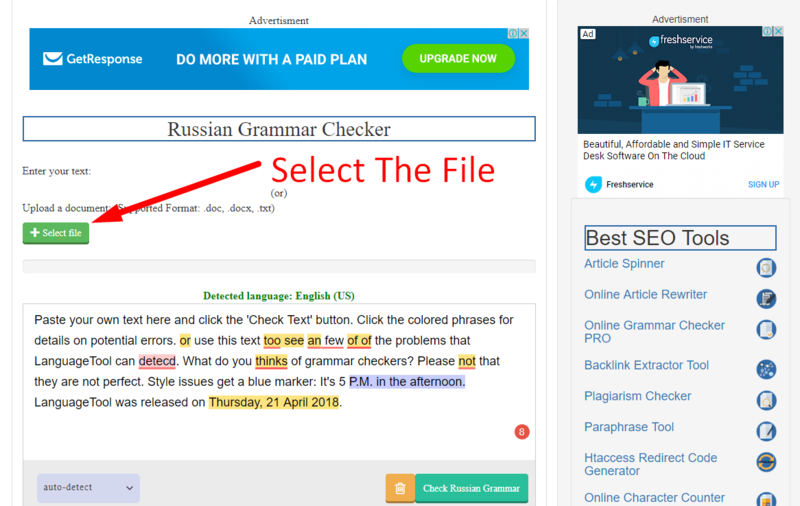 Moreover, these certain tools provide you a fully-featured and more user-friendly grammar detector that will you to have full control over your content by giving enough tips to learn basic Russian test rules. The beauty of these grammar correctors is, they are so smart and skillful enough to figure out common native speakers’ mistakes and improve overall Russian writing as well as speaking skills. However, to give you a deeper insight about this checker, let’s take an example of one of the above-mentioned tools to discuss it in more details. 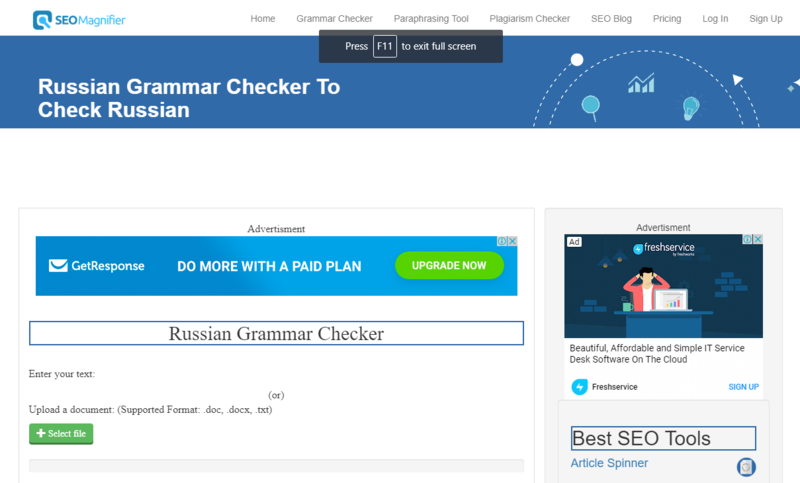 Why SEO Magnifier Russian Grammar Checker? 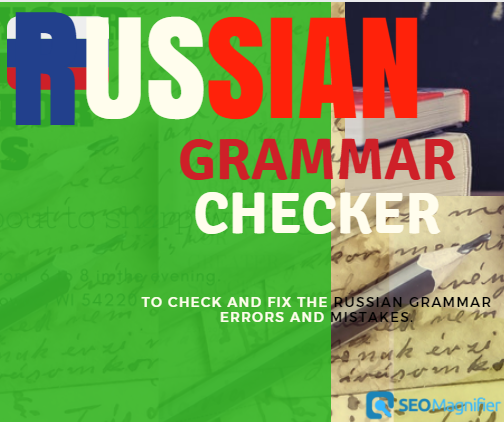 This Russian checker highlights and recognizes spelling, basic Russian and other languages’ grammar rules, as well as their style mistakes by offering various suggestions for improvement in that language. Even if there is more than one correct option, this tool will let you to choose one of them. More tellingly this grammar checker tools has the capacity to support more than some 20+ different languages that includes English, Russian, Spanish French, German, Chinese and many more. It also provides the users to check and proofread for spelling, punctuation and grammatical errors to avoid any sort of grammar mistakes and helps in improving efficiency and writing style of various native and regional foreign languages. So, intrinsically this tool is also among those State of the art grammatical correction tools that are often used by students of top universities, academic and content writer, freelancers and bloggers across the world. However, the following are the best things about this software. How to learn Russian using SEO magnifier? Now the first thing you need to do is select your language in which you are going to check error, then just type or copy-paste your text into the content box and press the “check Test” option. 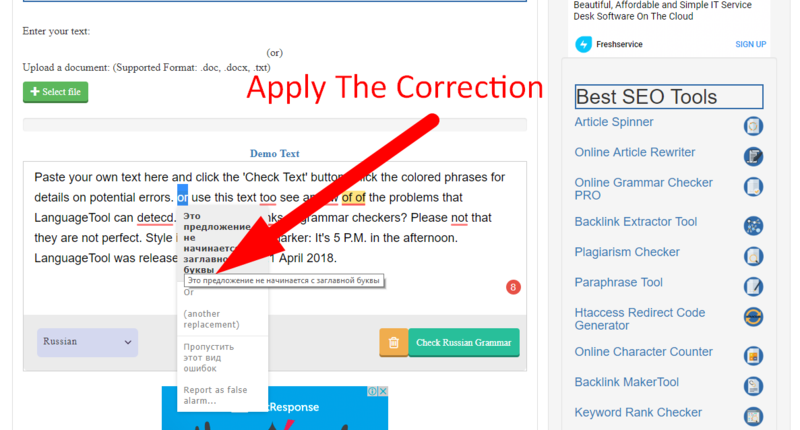 Now wait for few seconds it will show the results and If any grammatical, style or other spelling mistakes are spotted they would be highlighted in different colors and option moving curser on that color text it will show the suggested corrections and choice is yours which correction you want to replace in the text. This is how simple, super fast and accurate the tool is. This grammar checker tool will provide you the most accurate results that may be possible for any proofreader or spelling checker software to detect. It is also based on Languagetool that allows you checking corrections of almost 250 types of structural and spelling related problems. 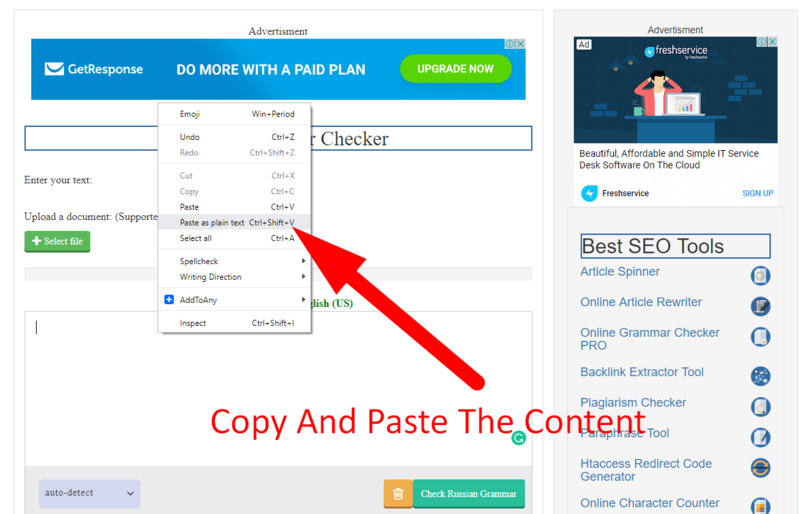 Use of Plagly.com will provide a certain advantage to professionals, academic writers, students, bloggers or even SEO experts to check text properly so that they can enhance their clarity on writing and style by minimizing each and every grammatical mistake while writing the content. Another good thing about this tool is, it gives you enough room to Proofread, check punctuation or search for writing error detection in languages like Russian, English, Spanish, Swedish, Polish, French, German and all 20+ other built-in languages. 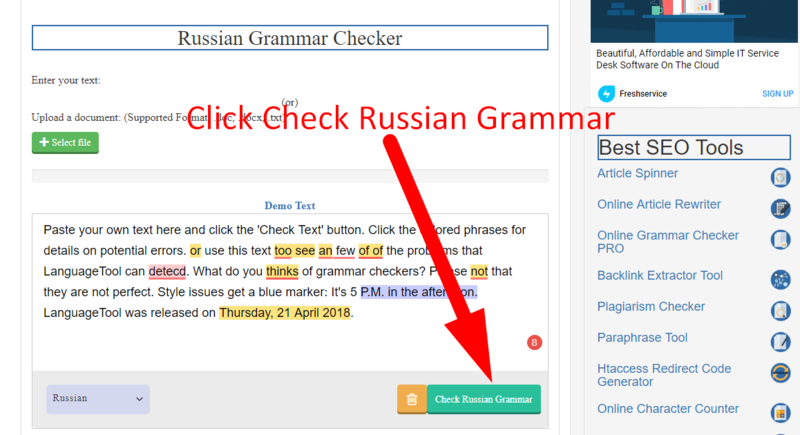 How to check Russian grammar online using SEO Magnifier? First of all, go to the tool page. Select the Russian document file. Or Copy and paste the Russian text. Click the "check Russian grammar" button. Click the highlighted words and select your favorite words and that's it. Conclusion: Finally it is very hard to deny the seo magnifier Russian grammar corrector tool by seo magnifier hasn’t any cons because there are always some shortcoming in every software. Thus like many other tools, it is impossible and very tough for this tool as well to recognize almost all the factual, spelling and grammatical errors in one go. Lastly, if you are doing any type of writing in Russian language content it is better to use this tool as this may be of great help to you not only in enhancing your writing skills but also for increasing your speaking skills in that language as well. However, if you are working on a very important content then being your well-wishers we recommend you not to solely rely on this tool, but either recommend using a premium version editor or proofreader to make sure your document should not lose its charm and look as good as it is supposed to be.